Could Spring really have arrived? We started straight after breakfast when the boys asked to play with the gloop again. I had saved the gloop from yesterday so set to work rehydrating it. Gloop dries out when you leave it, so to use it again you simply add more water and give it a good stir. Jasmine wanted to play with the Moon Sand, so using the kids ideas I decided to make a play scene using all the brown gloop as a swamp, the Moon Sand as a beach and I made a new batch of blue gloop for the sea! I made the brown gloop quite thick and the blue one much runnier, so the kids could explore the different textures. At the last minute I decided to add some shaving foam in as snowy mountains, but the kids moved them out when they started playing and didn’t add them back in until much later. I set up some play people, cars and diggers, a couple of boats and some rocks. The kids had a great couple of hours playing! At first they didn’t really mix the sand and gloop together. 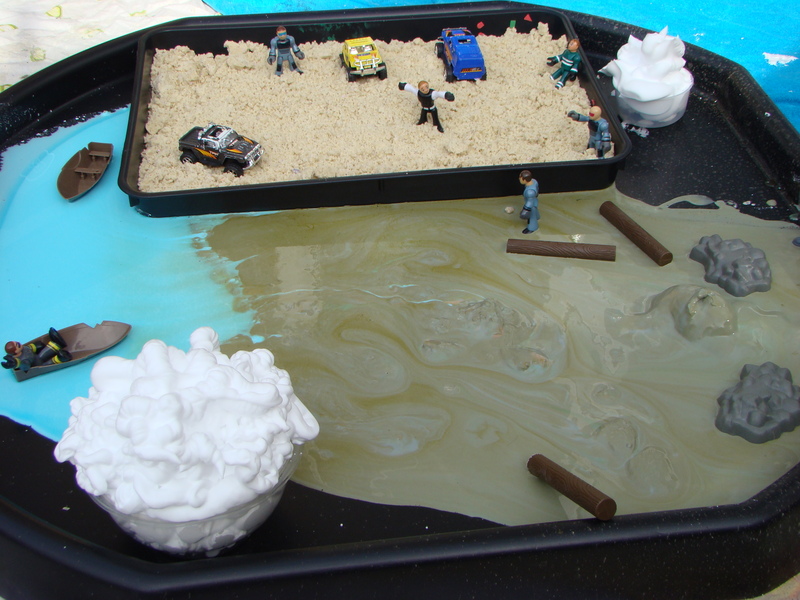 The boys stuck to playing with gloop and Jasmine drove some cars around and played with the sand. But eventually the boys did have a good time mixing it all together. Jasmine didn’t want to do this so I had to make sure they left some sand for her to play with – not easy when you have 2 boys determined to make a big mess! She took some sand out of the little tray and piled it up on “her” part of the Tuff Spot and made her own little beach scene. After a good couple of hours playing we got some bowls of soapy water out and washed some of the toys. The kids enjoyed this as much as they had enjoyed playing! After lunch, we headed back outdoors and spent the rest of the afternoon playing in the garden. I really hope this nice weather does last a little longer because it is lovely to be able to get in the garden and play.